‘The Imaginary’ is an interactive film. 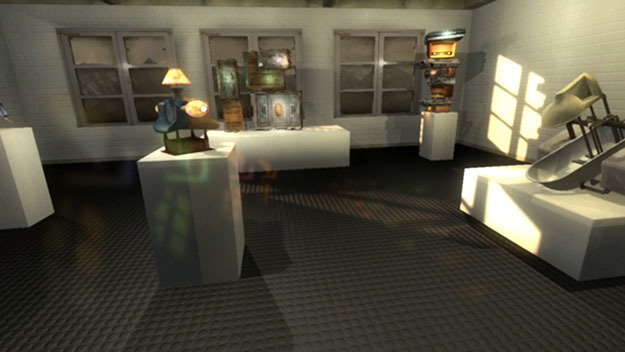 In this virtual computer scenario, viewers can explore a spatial environment. Viewers enter rooms where 3D models are arranged into meta sculptures and the environment itself already represents a sculptural act. Parallel to the visual level, an abstract narrative unfolds on the contextual level. 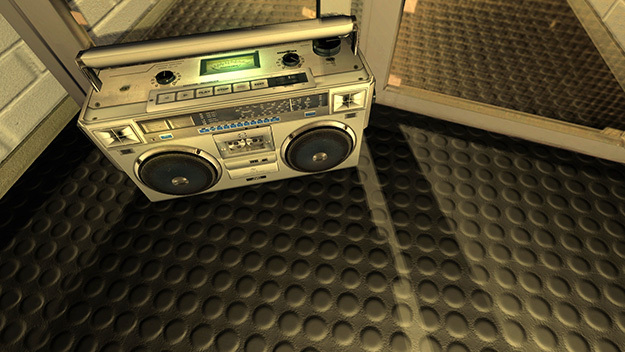 On their way through the three-dimensional environment, viewers repeatedly find themselves confronted with radios which emit the announcements of a moderator who, in commentary fashion, promises an explanation of the circumstances. One can hear an acustic collage of text fragments from the essay ’The Imaginary‘, an early book by Jean-Paul Sartre. This work is a phenomenological study of human imagination. In it, Sartre distinguishes between perception and imagination. He explores the extent to which humans really perceive the world, and at what point they necessarily begin to exceed the limits of perception through their imagination, whereby they have already begun to redesign the world itself. 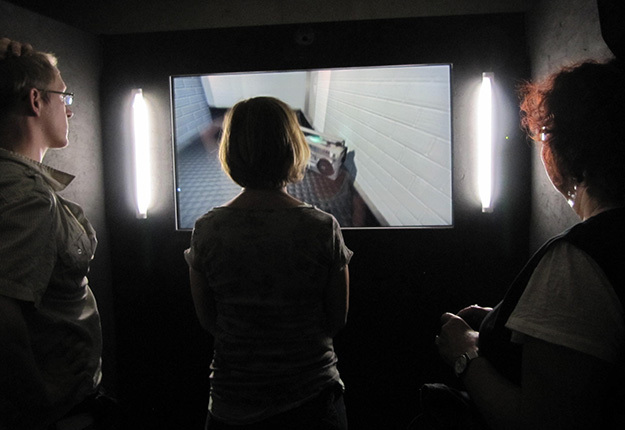 The installation contrasts the philosophical hypothesis of imagination with multimedia technology developed since Sartre’s work, which enables the artificial creation of imaginary worlds. This inevitably poses the question wether developments in media technology opened up new, free spaces for the mind, or if they are only constructing a colourful scenery that in the end only leads to visual consumability. „Das Imaginäre“ ist ein interaktiver Film. In diesem virtuellen Computerszenario kann der Betrachter eine räumliche Umgebung betreten, erkunden und wird dabei eine Handlung erleben. Man betritt Räume, in denen sich 3D-Modelle in Ausstellungssituationen zu Plastiken arrangiert finden, die Umgebung stellt für sich genommen schon einen skulpturalen Akt dar. Parallel zur räumlich visuellen Ebene entfaltet sich eine abstrahierte Erzählung auf inhalticher Ebene. Der Betrachter findet auf seinem Weg durch die dreidimensionale Umgebung immer wieder herumstehende Radiogeräte vor. Aus diesen Empfangsgeräten lassen sich Ansagen eines Moderators vernehmen, die in scheinbar kommentierender Funktion eine Aufklärung der Umstände verheißen. Zu hören ist eine akustische Collage von Textfragmenten aus dem Essay „Das Imaginäre”, einem frühen Buch von Jean Paul Sartre. In dieser Abhandlung geht es um eine phänomenologische Untersuchung der menschlichen Vorstellungswelt. Sartre unterscheidet hier zwischen Wahrnehmung und Vorstellung. Es geht ihm darum auszuloten, in wieweit der Mensch die Welt tatsächlich nur wahrnimmt und wann er notwendiger Weise beginnt die Grenzen des Wahrnehmbaren mit Hilfe seiner Vorstellungskraft zu überschreiten, wodurch er längst begonnen hat sie für sich umzugestalten. Diese Fragestellung verarbeitet die Installation in abstrahierter Form. Sie setzt die philosophische Hypothese in Kontrast mit der zwischenzeitlich entwickelten Multimedia-Technik zur künstlichen Erzeugung imaginärer Welten. Eröffnet die technologische Entwicklung neue Freiräume des Geistes oder zwängt sie ihn in ein Korsett aus Wahrnehmungslandschaften, die sich in der visuellen Konsumierbarkeit erschöpfen? Auf technischer Seite will eine steuerungsfreie Bewegungserkennung des Betrachters die Grenze der Leinwand auflösen und die Intensität der Immersion befördern. Der Betrachter kann dank einer kamerabasierten Gesichtserkennung interagieren, die zur Bewegungssteuerung in der virtuellen Umgebung dient. Darüber hinaus ermöglicht ein Touchscreen die Interaktion mit den physischen Objekten in der virtuellen 3D Welt. Die Realisierung wurde dank einer Software möglich, die vornehmlich in modernen Computerspielen Verwendung findet. Das Imaginäre | LIONEL Award 2013, Braunschweig| 6.9. Herbstausstellung | Kunstverein, Hannover | 28.6. – 12.8. This is the complete plot that runs on the Screen of the interactive film showing whole storyline and of about 11 minutes. The first scene in the video is a looped sequence, in which the speaker is inviting the visitor to come closer and to step into the circle on the floor in front of the screen. When somebody gets tracked, the radiovoice is personaly welcoming the user and starting to tell the story. Meanwhile the cameraview is adapting the users point of view and natively watching arround by the rotation of his head. By stepping for- and backwards a bit the camera is is starting to move into that direction. 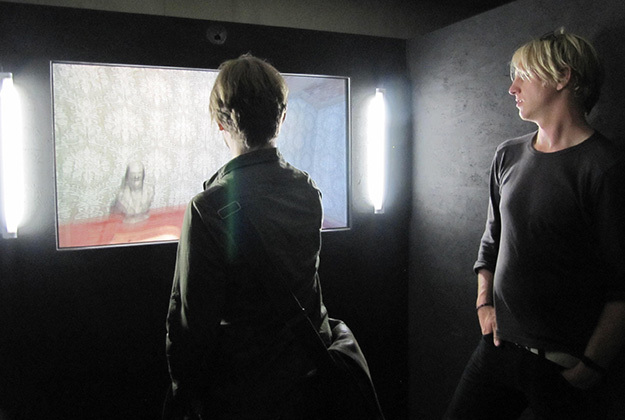 In this video you see people in front of the installation. 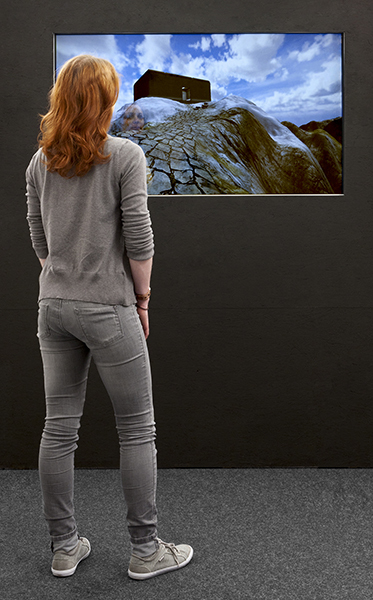 With little turn of the head the viewer can start turning arround or look up and down. I reconfigured the interpretation of movements since these pictures where taken. So they aren’t that sensible anymore and people can act more freely and slide sideways. 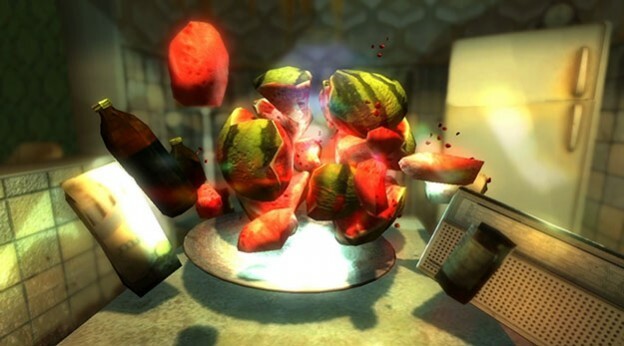 The video installation is built with hardware modification and 3d game development software. A headtracking software is locating the viewers face position and rotation and translating it into camera movement in the virtual world. Furthermore it is possible to interact with the objects of the virtual world by touching them on the touchscreen. It is my Diploma Project in Fine Art Studies and Communication Design and at the HBK Braunschweig, University of Arts, Germany 2011. The whole documentation of my diploma project with texts and images. The fixed version of the headtracker that works with the latest version of faceAPI 3.26.